HASTINGS – On Thursday (February 9), State Police in Hastings charged Dale R. Tracy, 43, from 1149 County Route 37 West Monroe, with two counts of Grand Larceny 4th degree, and Falsifying Business Records 1st degree, all class “E” felonies. The arrest stems from a month-long investigation. On or about January 6, Tracy allegedly stole a 2003 Ford Explorer and a 2002 Volkswagen Passat from a residence on Brecheimer Road in the town of West Monroe. Tracy signed DMV forms indicating that he owned the Ford Explorer, according to police. Both vehicles were reportedly located at a scrap metal business. 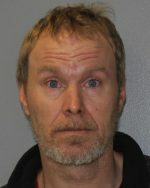 Tracy was arraigned in the Town of Constantia Court, and remanded to the Oswego County Jail in lieu of bail. He is scheduled to reappear in the Town of West Monroe Court on March 6.